Filed to: happy halloween?Filed to: happy halloween? A whole bunch of Queens commuters almost got to star in their very own horror movie yesterday when a rogue contractor accidentally bored through an F-train subway tunnel with a 10-inch drill bit. So, uh, happy Halloween. Or something. 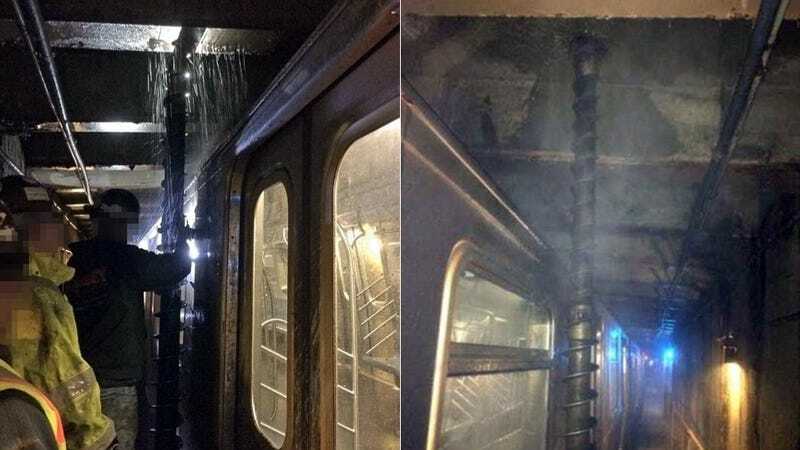 The operator heard a thundering noise on the roof and stopped the subway with the emergency brakes — and then discovered the drill extending from the roof of the tunnel to the floor, which struck down just inches from the side of the train. Apparently, contractors weren't even supposed to be drilling in that spot, but "some people don't follow instructions." Why no, no they don't. Fortunately for the 800-odd passengers on the train, the only physical damage was to the train's (now-shattered) windows and (now-gouged) steel frame. But according to one passenger "It's hard to believe that happened…How could someone screw up that bad?"